So, the Women's Cricket World Cup Qualifiers are the buzz of the town, in some quarters at least. This one day international event is even more important because it is taking place right here in Bangladesh. And let's face it, given the circumstances, the women's Cricket team of Bangladesh can actually give the men's team a pretty rough day. That isn't saying the latter will win or anything, but they'll probably be up for the challenge. Some of us have really high hopes riding on the Bangladeshi team this time around. The Tigers, or to be politically (in)correct the Tigresses, have already destroyed Japan. Yes, Japan has a women's cricket team. The Japanese were bowled out for a meagre 38 runs and Bangladesh won the game in 4.4 overs. Pretty exciting stuff, don't you think? Now, the last remaining obstacle for Bangladesh is to basically beat a strong Sri Lankan team. And then our One Day International Status will finally be sealed. Although the ODI status was supposed to come in the last match, ICC spokespersons have explained that there was a miscommunication and only if we defeat Sri Lanka do we get the ODI Status. Lots of complicacies have muddied the waters, but then again, its cricket. It's a complicated game. Despite the confusion, there is a certain decipherable hype about the tournament. The amount of interests the qualifiers have generated just whets the appetite for the big one. Women's Cricket World Cup does have an unbeatable history. The first version of the Women's World Cup was held in 1973, two years before the Men's World Cup. Although it is implied that the reason behind holding the Eomen's World Cup first was to understand how such a tournament could be held, it doesn't take away the glean off the trophy in anyway whatsoever. In a way, the women actually showed how it should be done and the men basically followed. The eighth Women's World Cup was held back in 2009 and it was won by England, who were also the champion's in the first ever Women's World Cup. Ironically, Australia have won the tournament the most times, winning 5 out of 8 and amassing 7 appearances in 9 finals. New Zealand, just for the heck of it, have also won it once. But who conquers on the Indian ground remains to be seen. West Indies and South Africa have already qualified for the World Cup proper, joining India, Australia, New Zealand and England. This time around as well, the most anticipated contest is that between Australia and England. But, there are plenty of dark horses to look out for, especially with both South Africa and West Indies looking strong, with the latter pinning their hopes on Stafanie Taylor, who has already scored three consecutive fifties. Before speaking of the women's empowerment and progress in the same breath as the success of this World Cup, it's best to calm down. It is not surprising that women can play sports really. Only a true chauvinist would react with surprise. This is about cricket and cricket only. We don't expect plenty of fireworks but it's a good feeling to stand behind a Bangladeshi team that actually has the potential, mentality and belief to do something we can all be proud of. Last week, our topic for BetaWriters was Lollipop. Quite a few good entries turned up and again, it was a close vote. But the piece below won out due to simple, good writing with all the right elements. Doesn't mean you guys should not try something different. But you have to make it flow. For next week, our topic is: Tower. Remember, you can choose to interpret topics as you wish. Submissions need to be sent in to ds.risingstars@gmail.com by Sunday noon. Word limit: 500 words. Good luck. “Li, li, li, me lollipop," was all he said when I returned home from a tiring day at school. His eyes gleamed as he rushed towards me while I untied my shoelaces. He would point at the letter L on my desktop and sing the song. It was after all his favourite song with his favourite candy. He got that from me, as I figured the easiest way to keep the tyke loyal to me was buying him lollipops. He would hide all his lollipops inside his pillowcovers so that no one would ever catch a glimpse of it. We ignored it like you ignore a dog hiding a bone. A very cute puppy dog. While I was getting the groceries he picked about a dozen lollipops and dropped them in the cart. Not even the fear of losing teeth forever could scare him. We were done buying the things and got down to the car. I noticed some urchins one or two years older than my brother playing with a tire beside the large bins. Then the car finally came and we got inside. He tore open the bag and took out a lollipop. He pretended to lick it and made a face that said, "Haha! I have a lollipop and you don't.” But I was too busy noticing the street urchins, who were staring at my brother. He realised what they had their eyes on. He quickly took all of them out and gestured to hide them in the seat covers. I smiled and plugged in my earphones. Before I could start playing the first song, I suddenly realised he had opened the door and was rushing down the sidewalk not caring about the big vehicles. He had all the lollipops in his hand. He ran and stood in front of the kids, pretended to count their number and then gave each one lollipop. My jaw dropped. My brother who wouldn't even share a small lollipop out of his hoard with me decided to share all his lollipops with a bunch of kids he didn't know. He laughed with them and waved them goodbye. Then he came back to the car and sat beside me. I was surprised. In a world where everyone thinks of big and unrealistic initiatives, he made me realise the simplicity and necessity of a single lollipop. Everyone should have the right to enjoy their favourite candy. On November 20, 2011, 1° Initiative volunteers teamed up and cycled along the roads of Dhanmondi, Gulshan and Uttara as a part of our campaign, titled 'Degrees on Wheels 2011'. Degrees on Wheels (DoW), a flagship project of 1° Initiative, started in 2010 partnered with 10:10 and 350.org, both international organisations working to tackle problems related to climate change. This year, we partnered with a new local youth organisation, Ongkuron. Our teams cycled along predetermined routes in their areas and stopped by schools and universities on the way, informing the students and teachers about the benefits of cycling. We encouraged them to try it a few times and decide for themselves. So why cycle? We picked this because so many of our members are regular cyclists, and are having a blast being one. Here's a list of very valid reasons we compiled - there has to be at least one that appeals to you! 1. It saves time. LOTS of it! You get a chunk of your life back. 2. It saves money. It's cheaper to buy, maintain and fix. 3. It saves space. The space it takes for one car can occupy up to 5 bikes imagine the emptier roads… that's enough to get us salivating! 4. It saves your health. 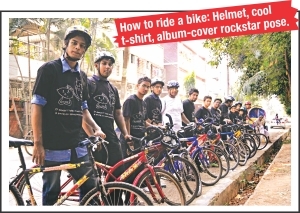 Face it, most of the youth are online or in the car; cycling will do wonders to their health! 5. It saves the environment. Less fuel usage, less harmful gas omission, a safer planet. 6. It's FUN! You get back in touch with your childhood, and it's something to do with your friends and/or cousins. Cycling isn't easy, and there certainly are risks, but what most people don't realise is that they take a similar risk, if not bigger, by travelling in a car, rickshaw, CNG, bus or on foot. Safety always comes first, so helmets are a must! Cycle safely, and you're bound to reach your destination in one piece, alive and healthy. Furthermore, our campaign encourages travelling short distances or within your area for starters before jumping to long distances and counsels parents and guardians to accommodate cycling in their lifestyles. To strengthen our campaign, we recently introduced a cycling training program, Training on Wheels (ToW). Expert cyclists teach beginner/intermediate level cyclists to ride a bicycle, and provide a safe platform for everyone to get plenty of practice until they are ready to hit the roads. This program will run all year long, currently happening at Baridhara DOHS, Dhanmondi, Gulshan and Uttara. We plan to extend to other areas in Dhaka soon, seeing the enthusiasm of so many people! We hope to make DoW more frequent, and approach institutions we couldn't reach before. Although we received a large number of applications, we could only accommodate those who could cycle well and took training and safety seriously; however, this encouraged the rest of our ToW session participants to try to be better riders. Over time and training, we expect more cyclists to join us in our group activities and advocacies, and with more cyclists in the streets, build momentum to get the government onboard for a safe and separate cycling lane. The enthusiasm isn't just for DoW or ToW - it's for cycling itself. The best way to support this campaign is to become a cyclist! If something so simple and fun could bring so many good changes, why not give it a shot?